Snapchat just announced that these several new features are to meant to appease the recent frustration of Snapchatters. Today we’re making a pretty big change to the way you create and send Snaps. We’re reorganizing the layout of our creative tools, adding a Magic Eraser (you’ll find this under the Scissor tool), and adding a new setting to the timer: infinity! Gone are the days that you only have 10 seconds to watch a Snap. This latest update gives Snapchatters the complete power to decide when their Snaps close. You can now send a Snap to someone as infinity, or "no limit", and the recipient will have the ability to watch that Snap for an unlimited amount of time. However, once the recipient closes out the Snap, all of the contents of the message will disappear as usual. You can also now set videos that you take on Snapchat to repeat or "loop". You can also now remove parts of Snaps and even replace it with a sticker or emoji. This new feature is called "the magic eraser" and the new icon is placed right under the Scissors and Paintbrush tools. 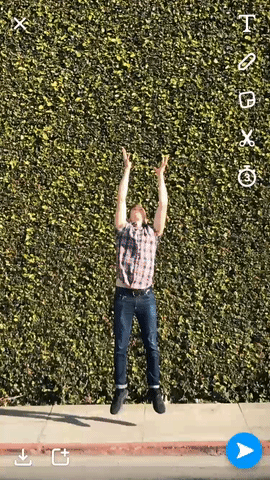 Snapchat has been quietly expanding it's editing tools lately and this new add-on could be yet another play to distinguish the app from Facebook's copies. Another fun new feature is the emoji brush. Snapchatters now posses the ability to draw in emojis. This new update by Snap completely changes the way Snaps are able to be sent. It's obvious the company is shifting towards a space to make the app more of a real-time Youtube as Snap is slowly rolling out Stories Search. It's important that camera company continues to push on and innovate despite the fact that Facebook is planning to copy Snapchat's biggest features.